Join former Chicago Bear Tom Waddle and Marc "Silvy" Silverman weekdays from 2 p.m. - 6 p.m. CT. for an in-depth look into the latest in Chicago sports, plus fun segments like "My Wife or Radio Partner" and "Would You Rather?" Don't forget to follow the show on Twitter! Missed the show? 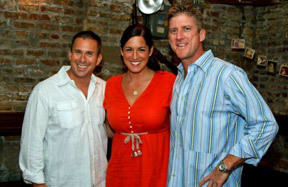 Download or stream full Waddle & Silvy podcasts posted each weekday. Waddle & Silvy broadcast from the Brew Pub for Bulls playoffs on May 13, 2013. 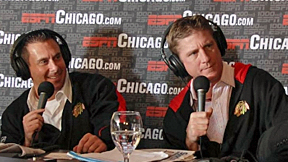 Waddle & Silvy broadcast live from Binny's South Loop on April 19, 2013. Waddle & Silvy at Rocky's for the White Sox home opener on April 1, 2013. Time for some golf. Did Carmen & Jurko even things up on "The Brute?" The first challenge was on the tennis court. Check out the carnage here. What would Waddle's career stats look like if he played with Jay Cutler? We have found the love child of Waddle & Silvy. Click if you dare! Check out some of the special guests we've had in the Cadillac State St. Studio! San Francisco 49ers coach Jim Harbaugh joined "Waddle & Silvy" and discusses the impact Marc Trestman had on his coaching career. Wayne Gretzky joins Waddle & Silvy to discuss Jonathan Toews' playoff slump and the Blackhawks' chances against the Red Wings in Game 4. Peyton Manning describes what it was like to play against Brian Urlacher, and if he thinks Urlacher deserves to be a first-ballot Hall of Famer. @WaddleandSilvy Mel Kiper Jr just said more words in 20 minutes than I’ve said all week! We talk to @MarkGiangreco7 now about Chet Coppock. What do you think about #MLB bat flips? It's commercial free @TWaddle87's world fun now. @karlravechespn talks #Cubs, #WhiteSox, and #MLB bat flips at 4pm. Talking #Bears schedule and #NFL draft w/ @DickersonESPN now. WHO ARE WADDLE & SILVY?